The BBC's Question Time programme is to be broadcast from Holyrood next month, making it the first UK legislature to host the long-running show. 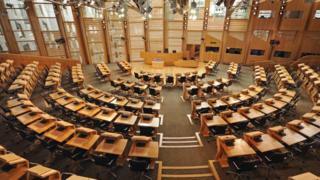 The flagship political programme will come from the Scottish Parliament's debating chamber on Tuesday 11 October. It is part of the Festival of Politics, which aims to inspire people of all ages to listen, engage and debate. Other events include interviews with Tory politician Lord Michael Heseltine and Labour's Dame Margaret Hodge MP. The annual festival will also feature Mary Beard, history professor Sir Tom Devine and author Darren McGarvey who recently won the Orwell book prize for Poverty Safari. Launching the programme, Holyrood Presiding Officer Ken Macintosh said: "The Festival of Politics is an opportunity for Parliament to really open its doors to the people of Scotland so they too can debate the big issues, while sitting in the heart of Scotland's democracy. "This year we will also become the first UK legislature to host the BBC's flagship political programme, Question Time, from our debating chamber. "For many fans of the show this will be the final opportunity to come and watch David Dimbleby in the chair of this long running and much loved political programme."